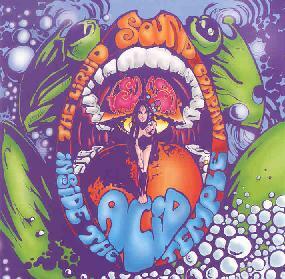 The Liquid Sound Company - "Inside The Acid Temple"
Texas space psychsters Liquid Sound Company return with an amazing follow up to their Exploring The Psychedelic album from a few years back. Founding member John Perez (also with doom metal band Solitude Aeturnus) is once again joined by Jason Spradlin and new member David Fargason (Vas Deferens Organization, Muz) replaces Teri Pritchard on bass. I'll tell you right off the bat that this is a serious slab of take-no-prisoners spaced out, fuzz laden mindfucked psychedelia. The disc opens with "Cubehead", which after a brief monologue sample launches into a fuzzed out acid rocking manna from psychedelic heaven that defines the bands name and sound. The guitars will make you drool, a substance that will mix in nicely with the matter from your melting brain. But "Cubehead" is a short track that serves to prime the listener for the remaining 45 minute journey. On "The League For Spiritual Discovery Lives", the band take a couple minutes to hypnotize the listener before launching into the trademark Liquid Sound rocking acid blast. Phased and wah'd trip guitars and pounding tribal drums are embellished by beautifully bubbling space efx. And at 8 minutes this sucker stretches out nicely. It rocks hard but will wrap its loving arms around your brain, massaging and caressing and injecting rainbows of colors and cosmic images. And the trip continues as the song segues seamlessly into "Preparation For The Psychedelic Eucharist", an ultra hypnotic mantra building tune. (Some of this is making me think of a more purely acid-psych version of Farflung.) And the voyage continues with the Eastern influenced title track, one of the most powerhouse mind assault songs of the set. I really dig the combination of sitar and swirling psych guitars and the throbbing Stoner undercurrent. "The Art Of Ecstasy" is a little different, communicating a jazzier mood, but is still mucho psychedelic. The Gospel According To Robot A. Hull" is a very cool psych song with a bit of a 60's flavor and blistering fuzz licks. "Free I" is a steady paced meditational ride with luscious whispers. And "Unfolding" is similar but a bit of a teaser as throughout its 9 minute length the percussion builds in a way that seems to be preparing for an explosion... but it never comes. Oh well, it still serves as a gentle closing track that allows the listener to cool down before rejoining physical reality. In summary, this gem easily made my best of 2002 list. One listen and you'll be hooked, though subsequent listens will reward you with new found treasures. Highest recommendation! For more information you can visit the Brainticket Records web site at: http://www.brainticket.com.